The top picks for May are movies about devoted mothers. This week I'm featuring Greer Garson as English matriarch, Mrs. Miniver. The photo above shows the entire Miniver family attending a church service. They are from left to right Walter Pidgeon; Garson; Christopher Severn; Richard Ney, and Clare Sandars. Kay Miniver (Greer Garson) is one of old Hollywood's noblest mothers. Her stiff upper lip never wavers in director William Wyler's classic World War II melodrama Mrs. Miniver (1942) despite the tragic loss of friends and family during the German air raids on southern England. The movie was one of the biggest hits of the World War II era, and Garson became forever associated in with the middle-class matriarch. 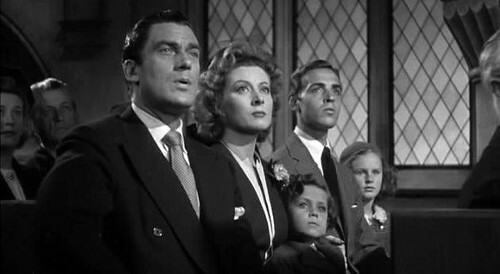 Mrs. Miniver, her husband, Clem (Walter Pidgeon), and their three children live in the cozy English village of Starlings, where the most exciting event of the year is the annual flower show. The Minivers quiet lives are turned upside down when the United Kingdom enters World War II. Their eldest son (Richard Ney) joins the Royal Air Force, and they must endure nightly bombing raids by the German Luftwaffe that rattle their nerves and badly damage their home. 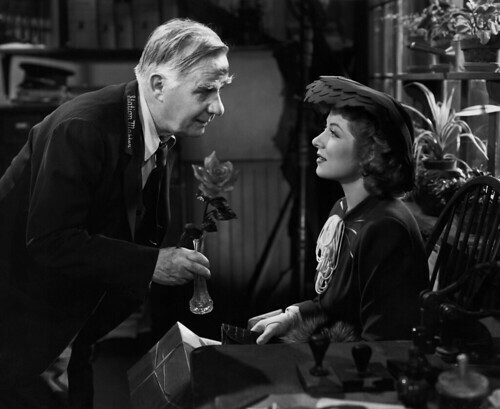 Kindly stationmaster Mr. Ballard (Henry Travers) shows Mrs. Miniver (Greer Garson) one of his beloved roses. Mrs. Miniver was released in June 1942, seven months after the United States entered World War II. The movie was based on the works of English writer Jan Struther, who wrote a domestic life column for the newspaper, The Times. Struther, who used the pen name Mrs. Miniver, began her column as a lighthearted take on English village life, but as war clouds gathered over Europe, she began to reflect the daily struggles of living under the Blitz. 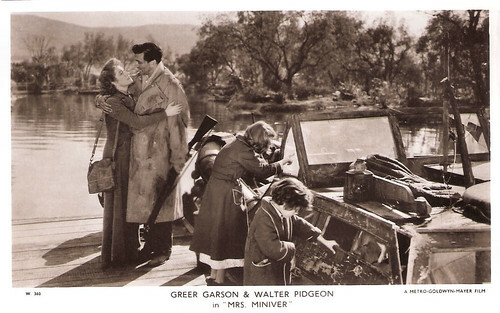 Mrs. Miniver (Greer Garson) welcomes her husband (Walter Pidgeon) home from Dunkirk in this British postcard. In 1939, Struther compiled her columns into a book that became an instant bestseller in America. Many Americans were strongly against intervening in the war in Europe, but readers, especially women, could relate to Mrs. Miniver's tales of rationing and building a bomb shelter under the family home. British Prime Minister Winston Churchill later claimed that Mrs. Miniver did so much for the war effort that it was worth a flotilla of battleships. 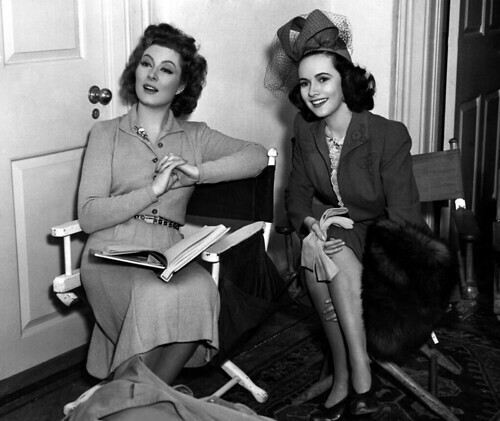 Mrs. Miniver began filming in early 1941 and the script was updated several times to reflect rapidly changing events. Mr. Miniver participates in the evacuation of British soldiers from the French harbor of Dunkirk (The brother of actor Henry Wilcoxon, who played the vicar in Mrs. Miniver, was killed by a German bomb while bringing soldiers back to England), and the role of a downed German pilot (Helmut Dantine) was made much more menacing after the Japanese bombing of the US Naval base at Pearl Harbor. Mrs. Miniver was a huge hit, earning six Academy Awards, including Best Picture, Best Director, and Best Actress. The movie still resonates today, 70 years after the end of World War II. Wyler directed many classics (The Letter, The Best Years of Our Lives, Friendly Persuasion), but in my opinion Mrs. Miniver is his finest film. It's a perfect balance between sentimental fare like the flower show (anyone who's seen the first season of Downton Abbey knows they lifted this story line almost verbatim), and riveting sequences like the family huddled together in air raid shelter while German planes drop heavy bombs overhead. Mrs. Miniver made Garson an icon of motherhood, even though at 37, she felt she was much too young to play a woman with a grown son. In fact, she and Ney, who was 25, fell in love while making Mrs. Miniver and they were married in 1943 (they divorced in 1947). There was a 1950 sequel called The Miniver Story, which followed the family into the postwar era, but it wasn't nearly as successful because it relied too much on soapy plots like Mrs. Miniver having a brief affair. Mrs. Miniver is available on DVD and video on demand.